Well, I did it! I have officially lived in Latvia for over a year, and I have a lot of people to thank for that! As with any jubilee, I think there should be a celebration, so this post is dedicated to all the people I have met and all the adventures I have had during my first full year of Latvian life! I literally started writing this two months ago… but I haven’t been able to really put this all together. I hope you enjoy mostly photos with some intermittent and scattered thoughts. 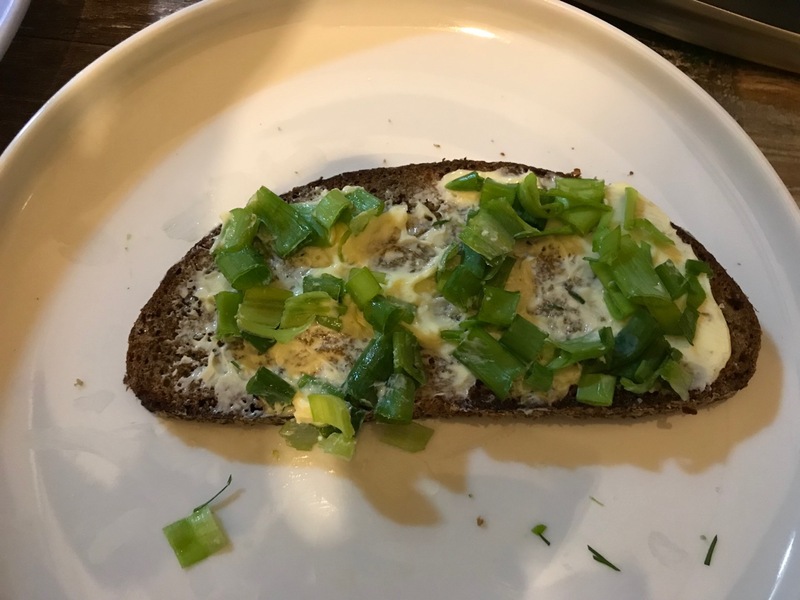 First of all, I include this photo of loku maize (spring onions on buttered rye bread) because when I was young, this was about as much of my Latvian heritage as I knew. My dad made bread on Fridays, and in the spring, we enjoyed fresh onion greens from the garden on the bread. We, of course, had other Latvian foods, but when I got to Latvia, I couldn’t wait to make one of these “real” Latvian sandwiches. Somehow, I connect this with my curiosity about my mother’s and father’s homeland which led me here after 45 years. So in writing this, I guess what took me so long is that I have literally thousands of photos from just one year in Latvia, so I had to sift through them to determine what has been important and sharable. One nice thing about coming to Latvia has been connected with my relatives on both the Grinbergs and Grinvalds side, but even moreso, it has been amazing to join a new family with Rita and Anna. We have had so many adventures in just 365 days and counting, traveling all over Latvia and even to Lithuania. And, of course, there is Jacques Balsam, the black cat with about six lives left. And not only have I connected with my new and old families here, but I have also been introduced to many of Rita’s friends, family, and colleagues from different countries like India, Belarus, Poland, and Germany! We have had many dinner parties where I get to share my love of cooking with everyone. So far, I don’t think anyone has had to go to the emergency room, so I would consider these parties successful! Looking back over the year, it is hard to believe how many cultural events we attended. They all blur together after awhile, and I do not have photos of all of them, but together they leave an indelible mark on my psyche. I have seen art openings, book readings, theater, opera, and many, many concerts. Highlights include the 2018 song festival which was beautiful and transcendent. Finally, I just found a lot of photos of the Latvian sky including sunsets, rainbows, and gorgeous cloud formations. I have continually thought that there is something magical about the skies of Latvia. I had this confirmed in some text, which I cannot remember right now, but some other author said the same thing. I love looking out the window each morning and evening and seeing the variations. I think Nebraska has amazing skies, too… but these are completely different. Of course, one of the best memories of the last year was traveling to America with Rita. I got to see most of the people that I miss so much, and I got to introduce Rita to all of these terrific people! One of the most common questions I get asked is what do I miss about living in America? Usually, food items come to mind, but, the answer is the people. I mean look at them! Aren’t they great? And Tombstone pizzas, Wimmer’s Weiners, Twizzlers, Root Beer, DQ, and barbecue. And let us not forget about Kraft Mac & Cheese (still trying to perfect an alternate recipe). In addition, I should do a blog post about Latvian beers… because it seems like I should miss beer in America, but the beer here is incredible. Okay, so after three months, I will finally publish this. I apologize for the randomness and for anything that I inadvertently included or did not include by total accident. Let it be known that nothing is my fault!! !